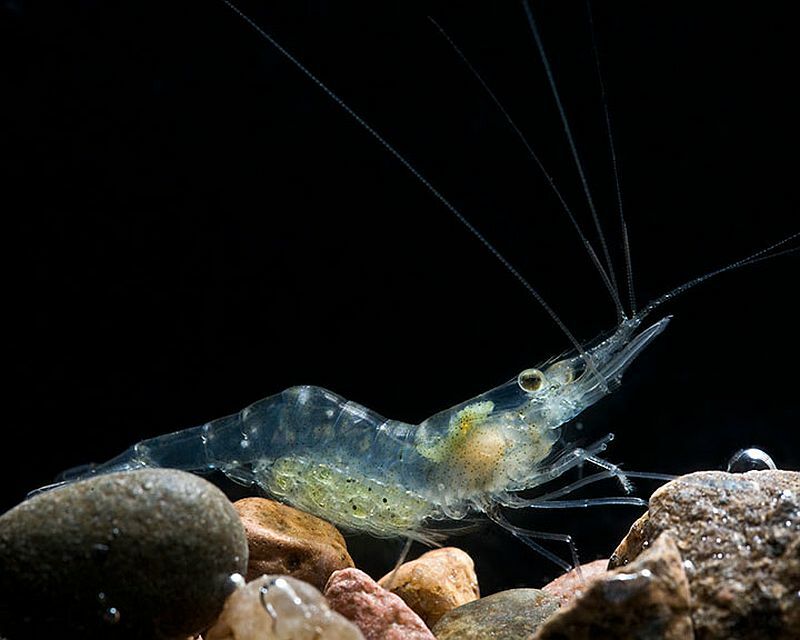 Although there are many freshwater species, Grass Shrimp are commonly known to tropical fish keeping enthusiasts and to anglers as jumpers, glass shrimp, ghost shrimp, glass prawns, hardbacks, daggerblades, and popcorn shrimp. Grass shrimp have a well developed “horn” (rostrum) with small teeth along the dorsal and ventral surfaces, no claws on the third pair of walking legs, and are rarely larger than 2″ in size. They have transparent bodies, but can camouflage themselves by using the pigment granules in their body. 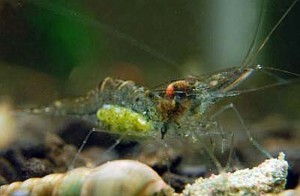 Grass Shrimp are excellent scavengers and make very efficient aquarium cleaners. They are always searching for any kind of leftover food or rotted vegetation in your tank and their transparent bodies along with their amusing food searching behavior make Grass Shrimp an interesting addition to a freshwater aquarium. Grass Shrimp do well in an established densely planted freshwater or slightly brackish aquarium of at least 10 gallons, with plenty of hiding places and a mature substrate. Although Palaemonetes paludosus is slightly larger than other more colorful freshwater shrimp, they should not be housed with fish large enough to make them a meal. They do well with small, peaceful species like Tetras, Guppies, Barbs, and Corydoras that do not pose a threat to them. When kept in large groups, Grass shrimp will readily breed in an aquarium environment. The female carries the the small green eggs, which look like small dots, under her tail. Because the young are so tiny, successful breeders remove the female shrimp to a brooding/rearing tank as soon as the eggs are noticed. When hatched, return the females back to the original aquarium and feed the fry rotifers, a suitable liquid “fry” food, or newly hatched baby brine shrimp. Grass shrimp are an excellent food source and bait for many types of freshwater and saltwater fish. They are also great for getting newly introduced, hard to feed, freshwater or marine species like juvenile sharks, frogfish, grunts, or lionfish to start eating. Grass Shrimp (Palaemonetes paludosus) are omnivores and will eagerly eat algae, detritus, and any left over food in the tank. When introduced into a newly set up aquarium, they should be fed a quality flake food or pellet. Grass Shrimp can be purchased at some tropical fish keeping shops, at some specialty bait shops or you can catch them yourself. The average purchase size is between 3/4″ to 1-1/2″.